Don’t Be Too Quick To Blame The Horse!! After riding a little while, I wanted to trot Buddy around the arena and then spiral in on a 20-meter circle on the West end. Buddy trotted so well, and I thought, “We are in great form this morning. This is exciting.” When we got down to the West end, I proceeded to spiral Buddy into a smaller and smaller circle. Finally, he was trotting very well on a much smaller circle than usual – maybe 6 to 8 meters. I hadn’t planned on him getting so tight, it just happened. I was about to move him out into a bigger circle. I had asked Julie to just wait quietly on Belle. All of a sudden, Buddy kind of hopped up and down. Then, he took off full-bore, like he was coming out of the starting gate at a race track. We were off on a fast gallop. I saw nothing but the fence posts whizzing by on our right side. I seem to remember Julie exclaiming, “Oh, my gosh.” The ride was exhilarating. We were flying. I absolutely loved it! But, I had no control over the horse, and the ride didn’t last for even 30 seconds, I don’t think. So, to make a long story short on that one, the neighbor gal came over, then the ambulance came, and I was hauled off to the local hospital where x-ray showed I had broken two vertebrae in my neck. I was never upset about my neck. It never hurt, particularly, although the halo I had to be in for 3 months was very inconvenient. A real nuisance. What I was very upset about was my horse! I was so worried I wouldn’t be able to ride Buddy. And, certain family members were demanding that I not ride Buddy again. I love Buddy. He is my horse. I have to ride Buddy. I couldn’t stand for years of our riding future to be abruptly cancelled like that!! Anyway, the family sentiments at that time were, “Bad buddy. Buddy is dangerous. Don’t ride Buddy.“ I had a talk with the social worker at the hospital, which helped my distressed feelings at the time. Months went by. A long time after my halo was off and my neck was healed beautifully with no after-effects or limitations, I was taking a riding lesson from a fellow and I described what had happened to Buddy and me. He said, “Oh, I know what happened. When you ride for awhile, the saddle can slip forward somewhat. 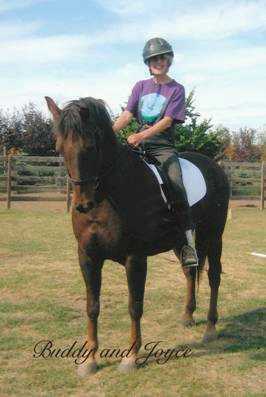 Then, when you get on a tight circle, the saddle can really pinch the horse’s shoulder. The horse will shoot right out straight.” I said, “That’s exactly what happened!” He said, “It’s happened to me. The horse can’t do anything else.” Well, boy, did I appreciate him telling me that!! Buddy was innocent of wrong-doing. Buddy was exonerated! Hurrah! I’m going to ride Buddy a lot this season, but I’m going to be very mindful to keep things very safe. MORAL OF THE STORY - Human people can so easily witness an animal engaging in some kind of behavior they don’t like, and express some version of “Bad Animal,” without making any effort to try to see things from the animal’s point of view. Maybe the animal was in pain at the time, or hungry, or exhausted, or any number of things could be wrong. Understanding and compassion go along way towards making for wonderful human-animal relationships. Let’s always be fair to the animals.